Total Outdoor Lighting offers low voltage solid cast brass professional grade spot landscape lighting fixtures (also known as directional lighting). This is a directional light perfect for highlighting. These landscape lighting fixtures are all built for long life and offer the perfect look to create drama and added security for your property at night. 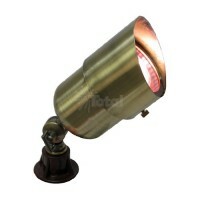 Many of these fixtures can be lamped with an LED MR16 or a halogen up to 35 watts maximum (sold seperately). Choose from several different styles and finishes such as solid brass, antique brass, antique bronze, architectural bronze and an aged acid green patina.